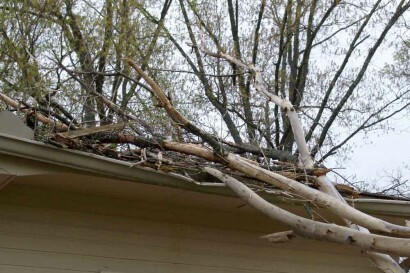 Last Friday, part of a tree fell on our house. 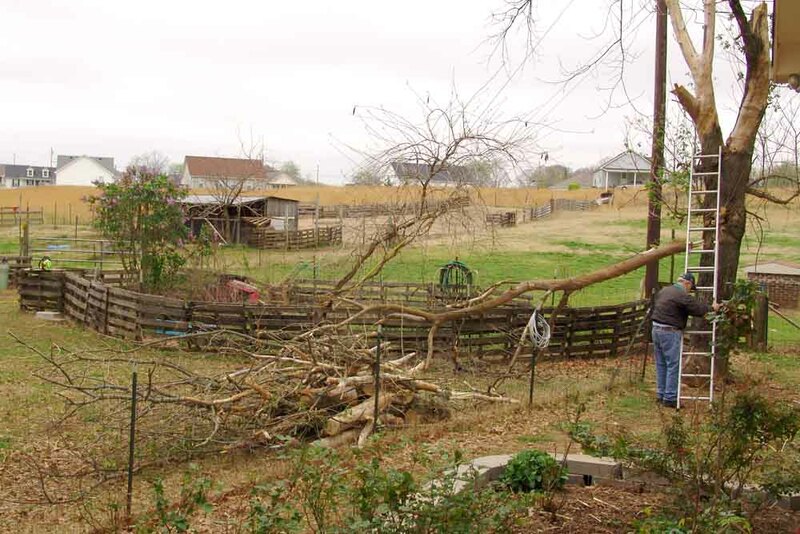 One of the neighbors called to tell me there was a tree on the house (I’d noticed), and he had a couple of chainsaws available to help remove it. I thanked him and told him I’d pass along the information. 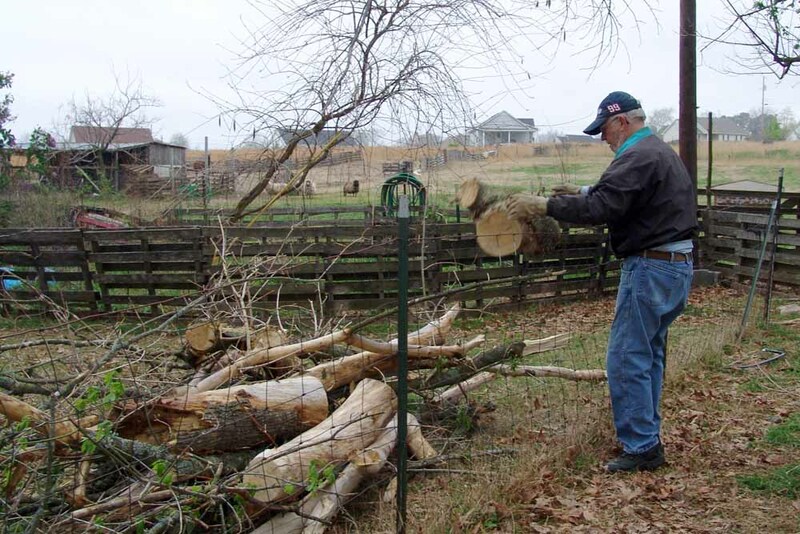 However, by the time The Farmer gets home from work, it’s a little late to start such a big project, so he opted to do it Saturday morning. Our youngest son, aka the Cave Geek, offered to help. I offered to help. 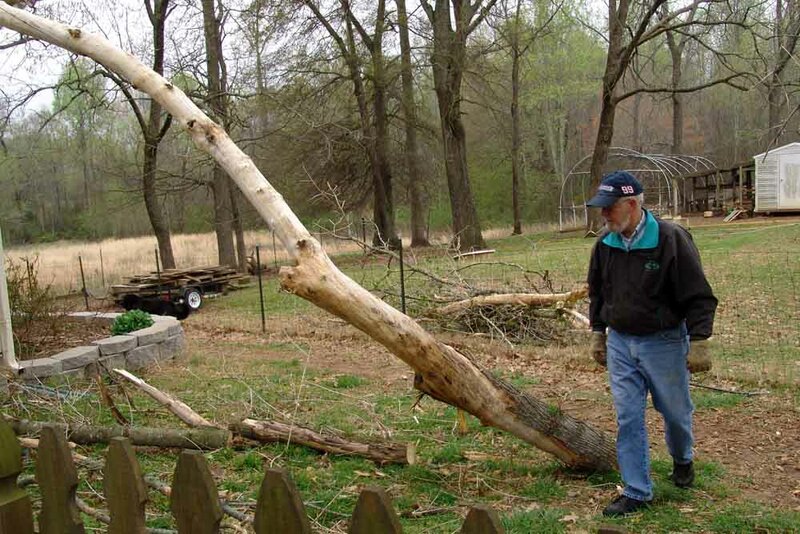 The neighbor had offered to help. But the first I knew he was even working on it, he’d already got a lot of the limbs away from the house. Yes, Mr. Stubbornly Independent was well on his way to getting the job done, and though we once again offered to give him a hand, he declared it was really a one-person job. After that, I just stood around and took pictures and wisely (I thought) refrained from offering advice. Fortunately, the only real damage done was to the gutter. 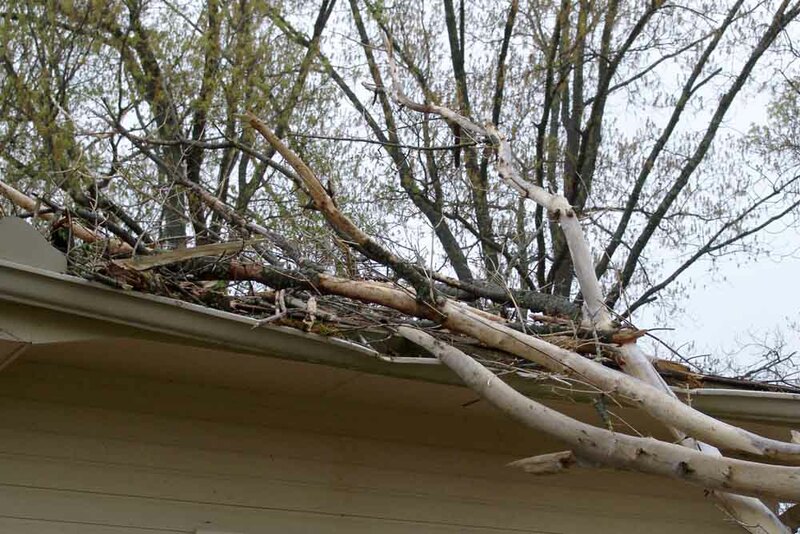 It got rather bent out of shape, and the edges of the roofing got a little crinkled, but otherwise, there didn’t seem to be any real harm done. 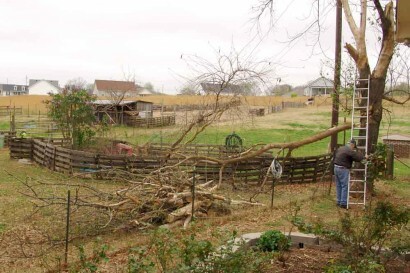 The Farmer got all the tree away from the side of the house, then started cutting it up into manageable pieces. You need to enlarge this one to see all the sawdust flying! 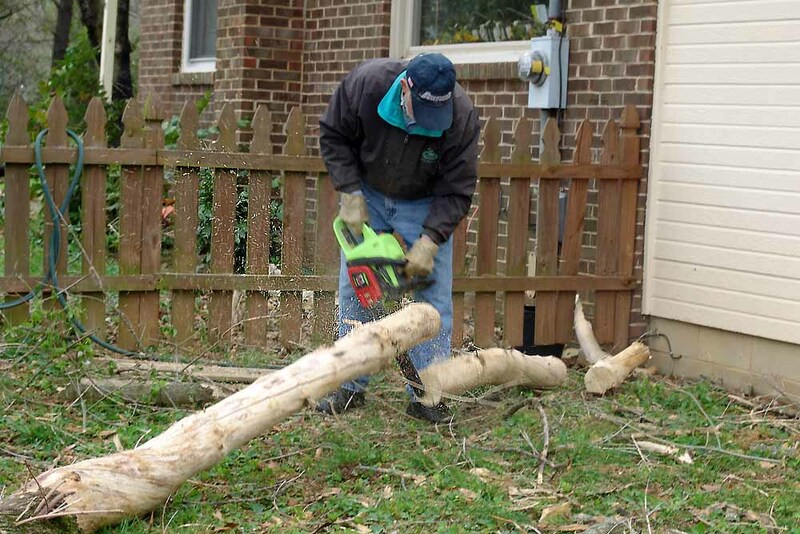 Look at that strong guy tossing those logs around! 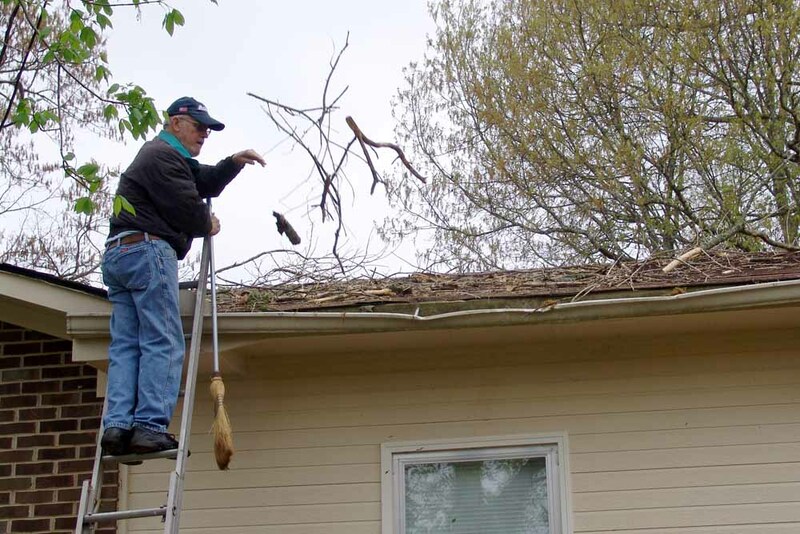 After the big stuff was out of the way, there were still a lot of small branches and twigs left on the roof, so Farmer climbed up there to get them off. 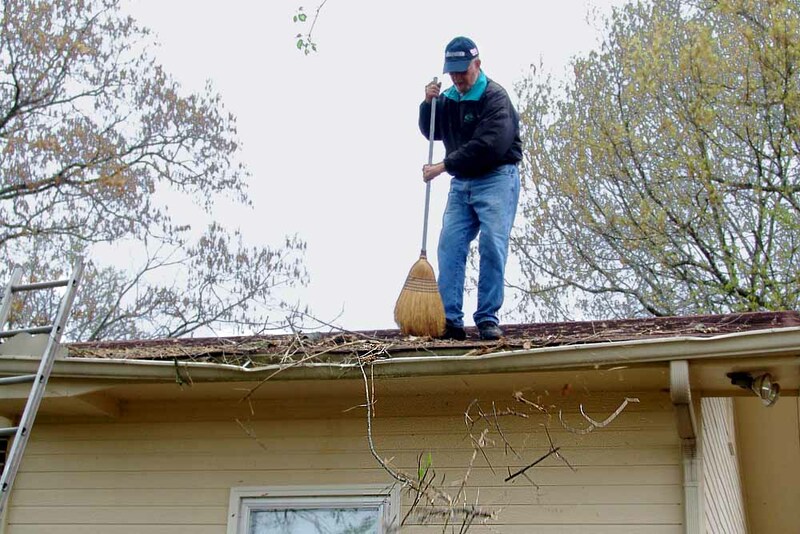 The easiest way to get the smaller stuff off the roof was to sweep it off. Just look at that! 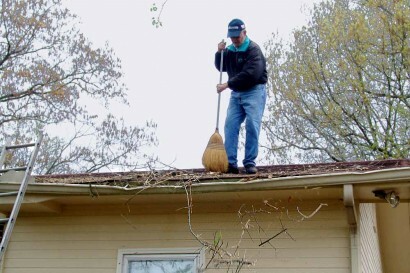 Who would have guessed the macho Farmer knows how to use a BROOM! While he was on the roof, he decided to clean out the gutters. They fill up as fast in the spring from fallen tree “fruit” stuff as they do in the fall from fallen leaves. 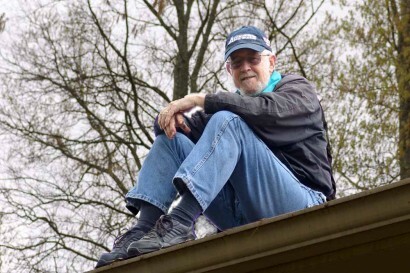 After crawling around on the roof, the Farmer took a break. But he wasn’t done for the day. Oh no! I may have thought he was, but then I looked out and saw him up in a tree! 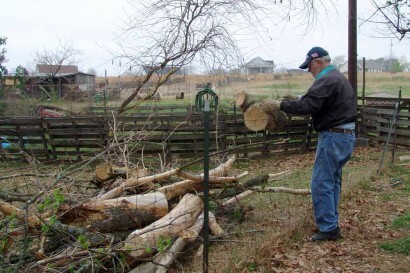 He’d decided to cut off some more of the dead wood to prevent it from falling on the house in the next windstorm. However, this tree has power lines running through it. 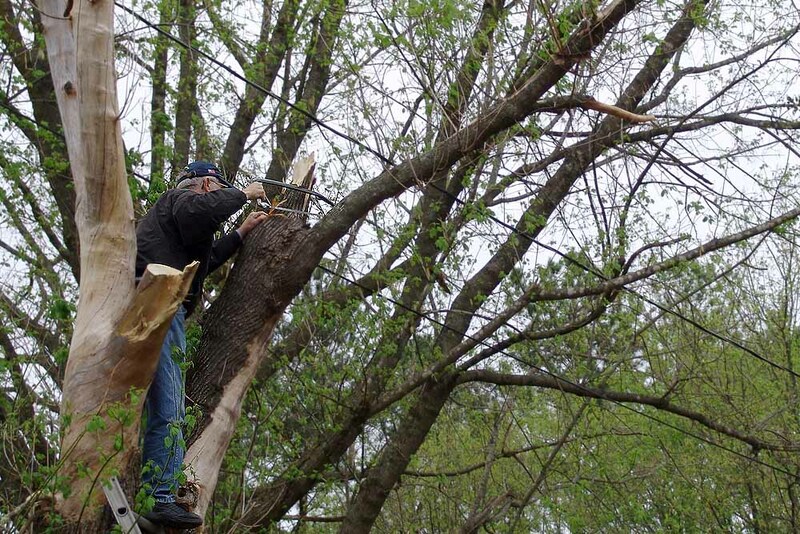 Of course, those power lines were one of the reasons I wasn’t thrilled about him getting up in the tree, so he didn’t mention those plans to me. 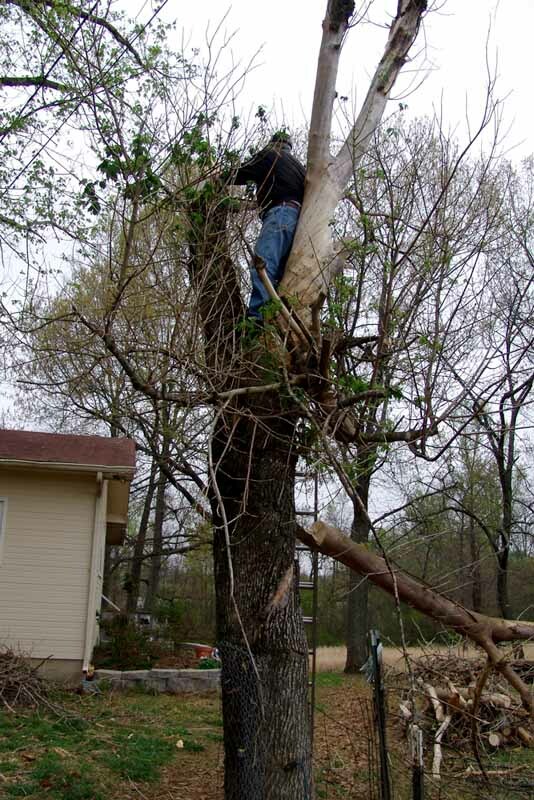 But he got the more limbs down, so I guess he was pleased with that. He certainly had a bunch of wood for burning when he was done! And I think he finally wore himself totally out, so he took a rest by the rose bed with his best buddy, Toby. 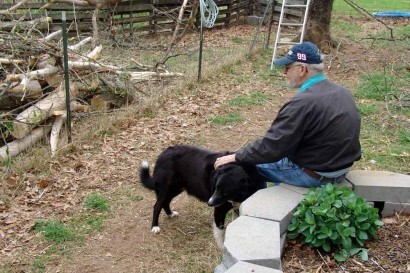 The Farmer with Toby, our Farm Collie. After he’d rested a while, he did manage to cart a few loads off and burn them, but there’s still a lot of wood left in that pile. I’m thinking it will be a while before all that fallen wood is totally gone! I think we’ve pretty well established that our farm collie, Toby, loves playing in water more than anything else on the planet. However, creeks and puddles and water spraying out of a hose aren’t always available, so what does he do with the rest of his time? He plays with sticks. 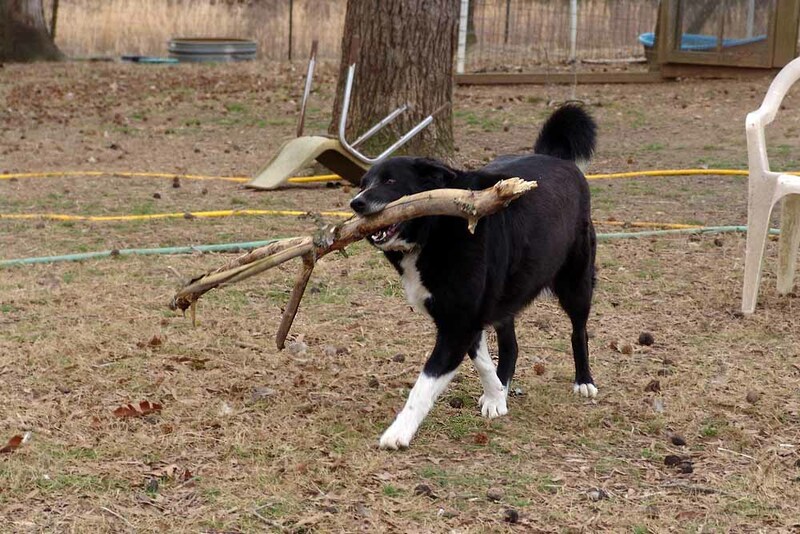 Anything from a tiny twig the size of a toothpick to a 2×8 board to a log so big he can hardly drag it around. 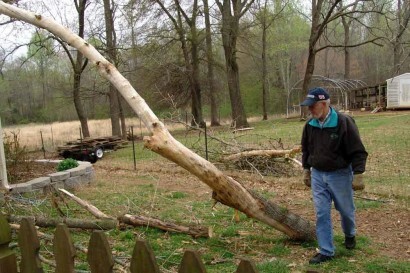 We had a big limb fall out of a tree a while back, and The Cave Geek broke a chunk off to give to Toby. This was great prize to Toby! Ha, ha! It’s mine, all MINE!!!! 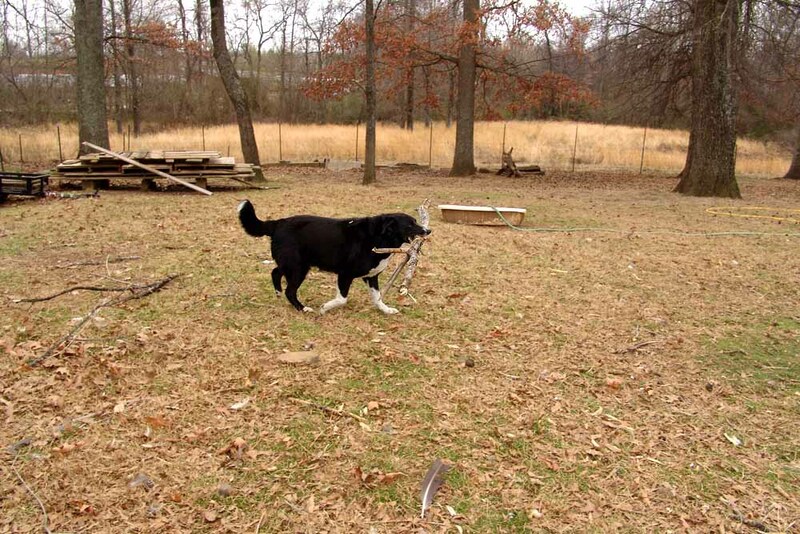 He carried it all over the place, even though he could barely close his mouth around it, and drooled cause he couldn’t swallow with that big chunk of tree in his mouth. Walk softly and carry a big stick? This just happens to be his idea of a good time. 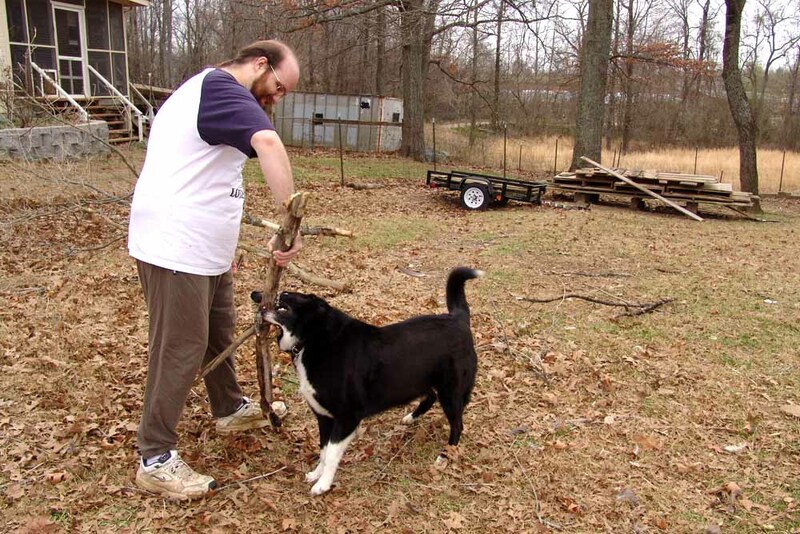 In fact, the minute you go out the door, the first thing he does is look for a stick. It doesn’t matter what size, he’s just got to have one! After a while though, carrying it around isn’t enough. He has to chew on it. 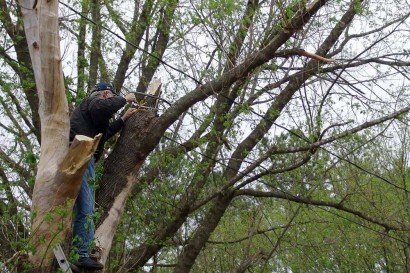 The video may not be the greatest, but you can hear a couple of good crunches in there and see those nice big teeth working on reducing that bit of log to splinters. That isn’t the biggest chunk of wood I’ve seen him carting around, but like I said, he’s not picky about the size. Sometimes he has little sticks that look like he’s got a cigar hanging out of his mouth. Sometimes he plays lumberjack. 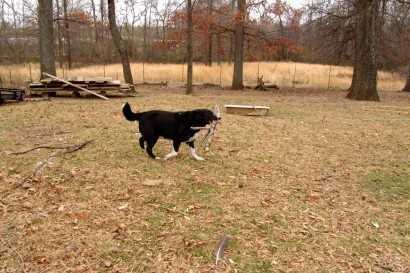 But whatever the size, carrying and crunching wood rates right up there as his second favorite pastime. I decided to meander around in the woods after the flood waters receded, just to see what might have been left behind. 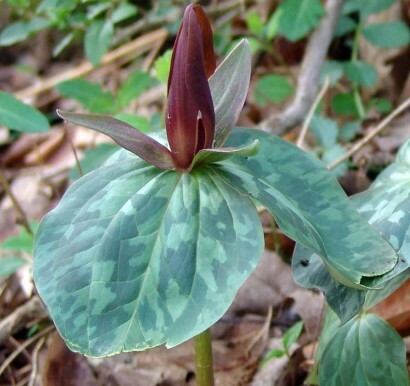 The first thing I noticed when I walked in the woods was the Trillium is finally up and blooming! Most of the buds aren’t fully opened yet, but these are some of the first flowers around here to welcome spring. 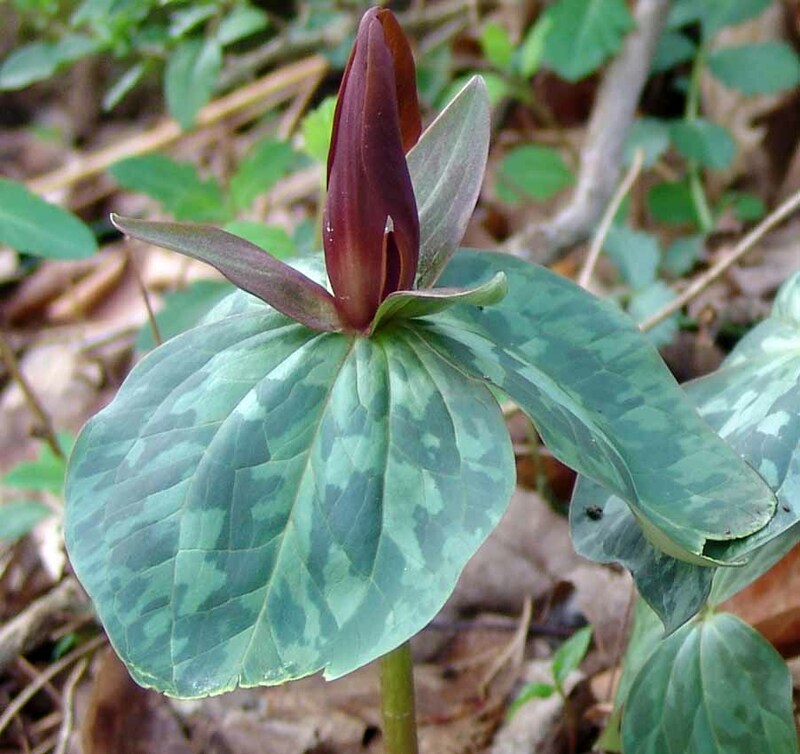 This particular variety, Trillium cuneatum, is also known as Whip-Poor-Will Flower, Cuneate Trillium, Large Toadshade, Purple Toadshade, Bloody Butcher, and Sweet Betsy. That’s sure a lot of different names for one little plant! Nearby there was some Virginia Springbeauty (Claytonia virginica) blooming. 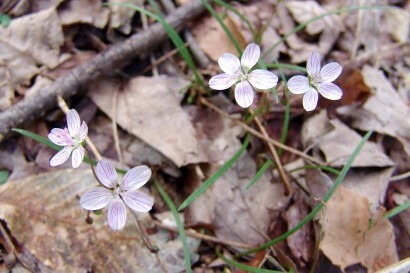 These little flowers pop up all over the place in the woods. 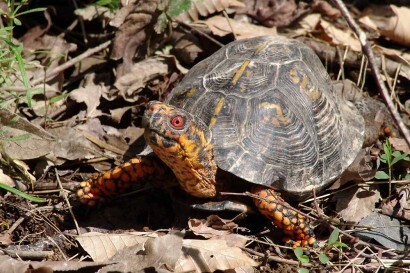 Of course, after the flood waters had been through, they weren’t the only buds in the woods. 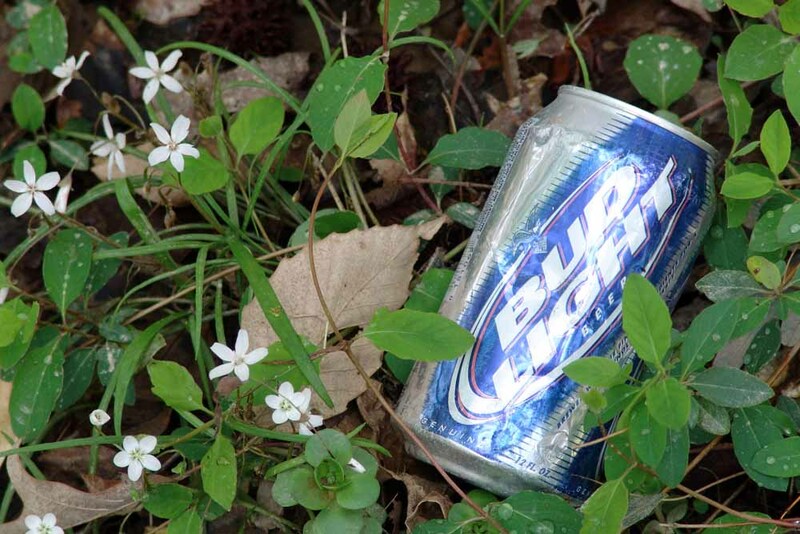 Nestled among the other flowers, there was a special metallic version known as “Bud Light”. It’s frustratingly long lasting in the woods, and the only flowers that appear with it are the blooming idiots who consume a little too much of this bud’s nectar. I don’t know if this particular denizen of our woods tried any Bud Light, but he was certainly laid back. 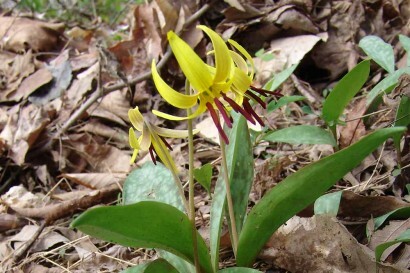 He was wandering near yet another patch of flowers, some Yellow Trout Lilies, also known as Dogtooth Violet. 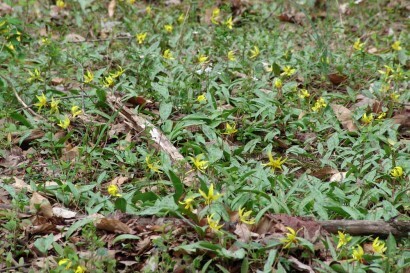 They’re another one of the first wildflowers to bloom around here come spring. 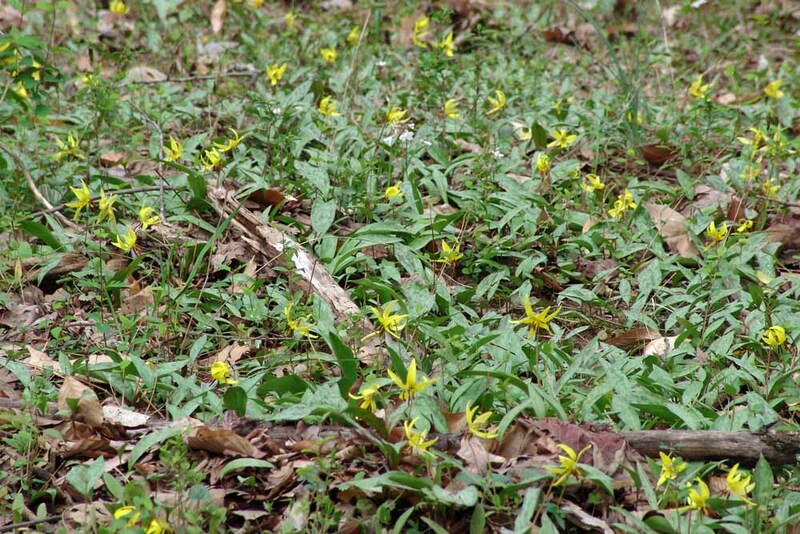 They are such a pretty bright yellow, and look particularly cheerful after the drab browns of winter. 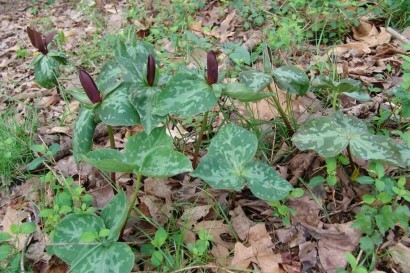 Supposedly, this plant is called a TROUT Lily because the mottled leaves resemble the patterns seen on trout fish. At first I thought it was dead, considering the flood waters were long gone and there was only a little puddle of water left underneath it. However, when I touched the fish, it moved! Whoa! 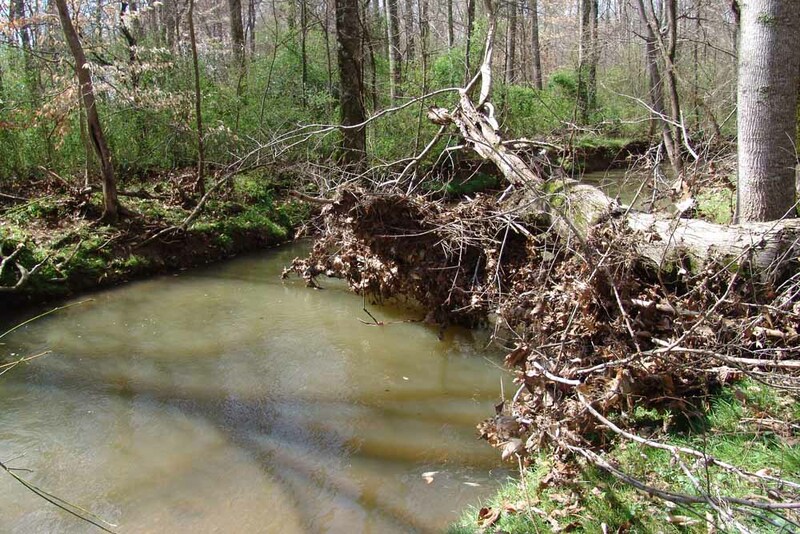 time for a rescue operation – get it to the creek quick! 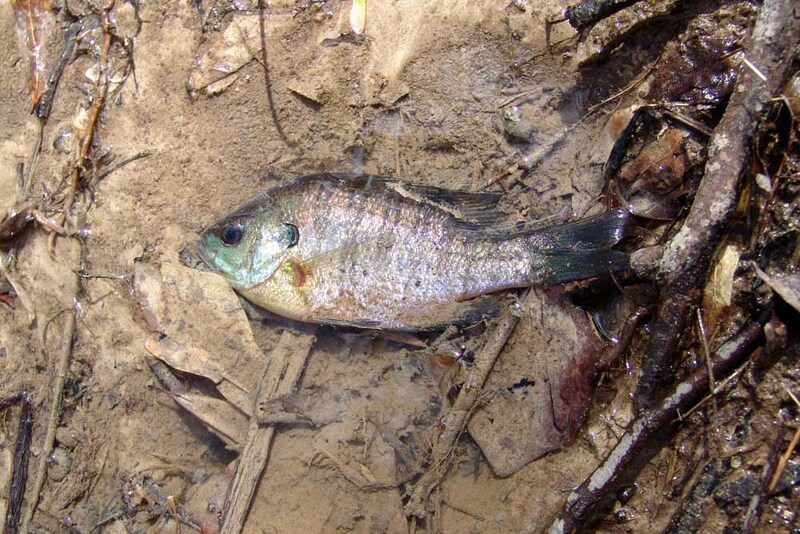 I tried scooping it up with what little water there was, but the fish was unimpressed with my rescue efforts and flopped out onto some leaves. Now here’s where I wish I had someone following me around and taking movies of some of my misadventures. I mean, surely ONE of them would go over well enough on Funniest Home Videos to win the big prize! Just picture a chubby old lady chasing after a little fish flopping all over the fallen leaves in the middle of the woods. 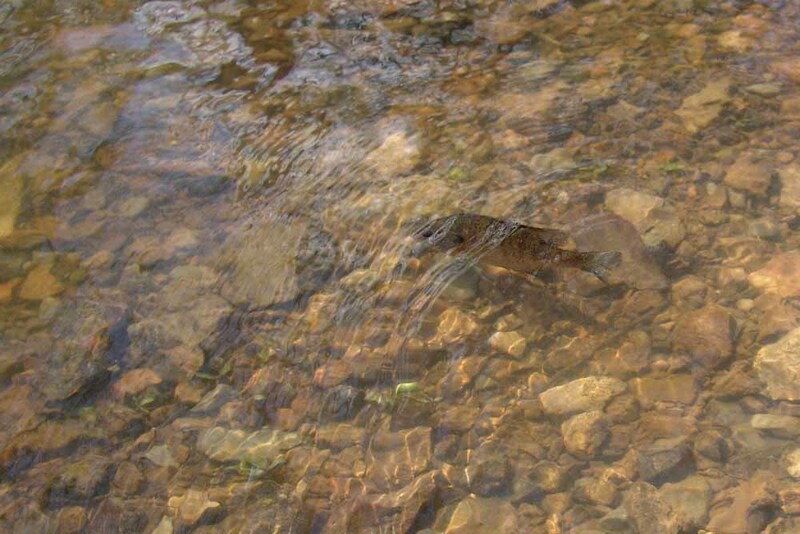 I picked it up several times, but it was a slippery little devil and would manage to get loose once more, and there we’d go again… fish flopping, me hopping. Finally I sandwiched it between some leaves to hold it fast and ran … well, stumbled really, as fast as I could to the creek, trying to get there before the fish ran out of air. I’m not sure which one of us was gulping for air the most by the time we made it to the creek. 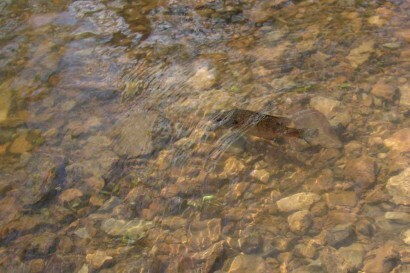 Despite the prolonged lack of water, after I deposited the fish sandwich in the creek it wasn’t long until the fish was swimming off. 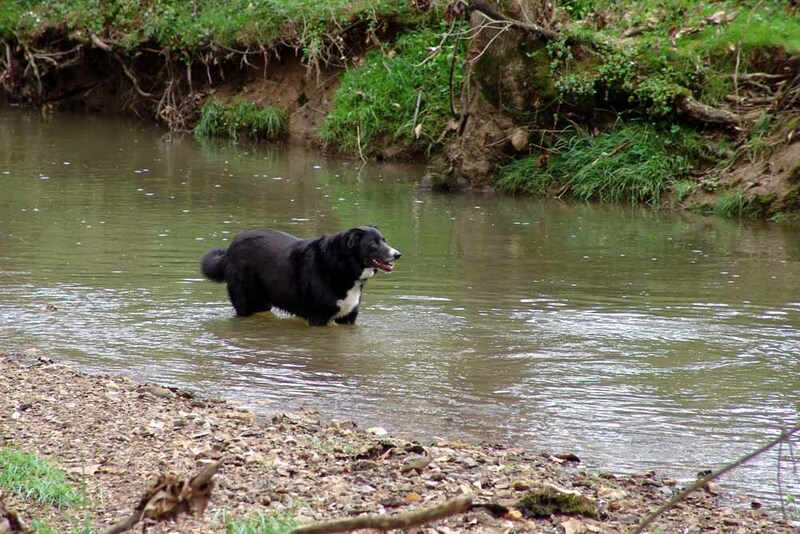 Since we were by the creek, our Farm Collie decided it was a good time to wade right in. Toby loves playing in water no matter what the temperature is! 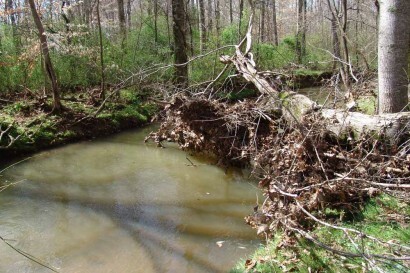 As you can see here, the flood waters left a lot of debris. All kinds of leaves and stuff caught in the branches of this fallen tree. On the bank nearby, I found a black plastic milk crate which I carried back to the feed shed. I even found something to carry in it on my way out of the woods. Like Wilson, this ball was washed to shore. I think it needs a name. Should it be another Wilson or something entirely different? It’s generic, with no name imprinted on it anywhere. 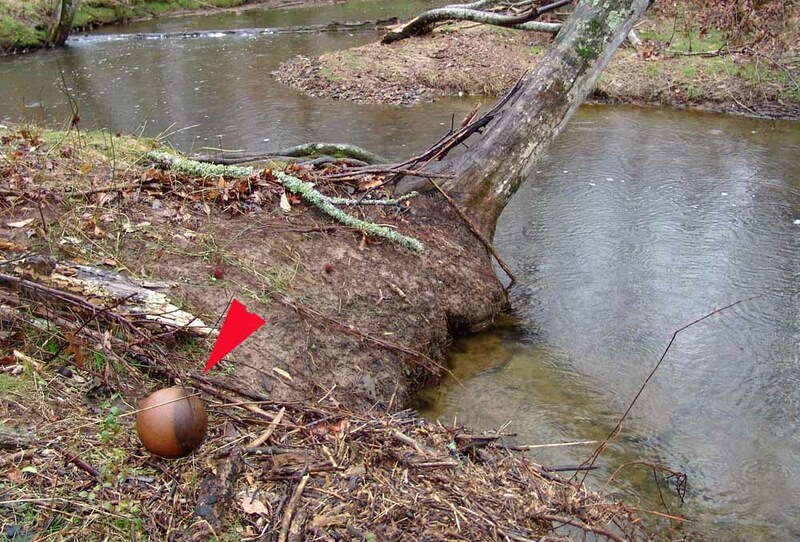 What would you call a little mini-basketball left behind after a flood? What with spring flowers, stranded fish, a turtle and cast away basketball, this was definitely one of the most interesting walks in the woods I’ve had in a while!